Publication: October 28th 2013 by Entangled: Embrace. Her theory of attraction is about to get a new angle. Spring Honeycutt wants two things: to ace her sustainable living thesis and to save the environment. Both seem hopelessly unobtainable until her college professor suggests that with a new angle, her paper could be published. Spring swears she’ll do whatever it takes to ensure that happens. “Whatever it takes,” however, means forming a partnership with the very hot, very privileged, very conceited Henry Knightly. Henry is Spring's only hope at publication, but he's also the über-rich son of a land developer and cash-strapped Spring’s polar opposite. Too bad she can't help being attracted to the way he pushes her buttons, both politically and physically. As they work on her thesis, Spring finds there's more to Henry than his old money and argyle sweaters…but can she drop the loud-and-proud act long enough to let him in? Suddenly, choosing between what she wants and what she needs puts Spring at odds with everything she believes in. Definitely, Maybe in Love is a modern take on Pride and Prejudice that proves true love is worth risking a little pride. I love Jane Austen. I like retellings too. This retelling is really keeping on the same track as Pride and Prejudice. I wasn't sure I would like it, but I adored it immensely. I found that because I loved Pride and Prejudice, I just fell in love with Henry easily. One would think that because it so closely followed the book that you wouldn't enjoy it because it would be predictable but that wasn't the case. There was just enough of modern times in it that I was intrigued and saw a new twist on a classic book. I simply adored Henry. He was a little socially inept and geeky but I loved watching him grow and came to love Spring. He was loyal and didn't see himself as a Hot Stud. He loved his sister. I really liked that he may have been rich but he gave back and helped others. Henry was easy to fall for. Gah, he is totally swoon worthy because of what he is on the inside not just the good looks on the outside. Spring, well she took a little more time for me to warm up to her. She ran hot and cold with Henry. She was sometimes annoying. She was very opinionated in her environmental issues and couldn't see past it. I know that was the point in her pride and prejudiced ways. So, kuddos to the author for that. If you like Pride and Prejudice than you will enjoy this book. I don't want to say too much because since, if you read Pride and Prejudice, you would know how it goes and then the new twist would be spoiled. So in other words, YOU HAVE GOT TO READ THIS VERSION! Ophelia London was born and raised among the redwood trees in beautiful northern California. Once she was fully educated, she decided to settle in Florida, but her car broke down in Texas and she's lived in Dallas ever since. A cupcake and treadmill aficionado (obviously those things are connected), she spends her time watching arthouse movies and impossibly trashy TV, while living vicariously through the characters in the books she writes. 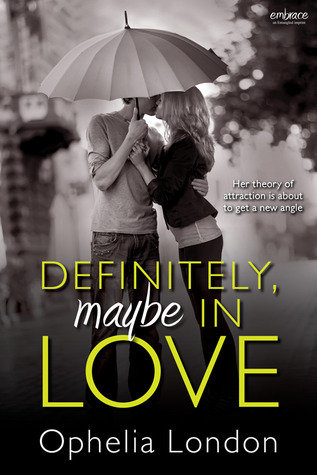 Ophelia is the author of DEFINITELY, MAYBE IN LOVE, ABBY ROAD, and the Perfect Kisses series including: PLAYING AT LOVE, SPEAKING OF LOVE, and "untitled #3" (Jan 2014). Visit her at http://ophelialondon.com. But don't call when The Vampire Diaries is on. Very good, I think I found the knowledge I needed.